One of our top Wyoming outfitters has just picked up the hunting rights on one of his grazing ranches that hasn’t been hunted the past 4 years. He will take one or two mule deer hunters and a few pronghorn guys this upcoming fall. We expect the deer to average in the 160 class, with the possibility of taking something special. He sees quite a few trophy pronghorn bucks on the ranch while working his livestock and expects to take some great bucks. The ranch is about 8,000 private acres located in southeastern Wyoming. DRAW DEADLINE IS MAY 31 AND THE EXCITING PART IS WE EXPECT HUNTERS TO DRAW A GENERAL DEER TAG IN THIS AREA WITH 0 POINTS. PRONGHORN MAY REQUIRE 1 POINT FOR GENERAL OR 0 POINTS ON THE SPECIAL DRAW. MULE DEER $4000 5 DAYS 2X1 October 15 to 31. PRONGHORN $1800 3 DAYS 2X1 October 5 to 31. MULE DEER/PRONGHORN COMBO $5000 5 DAYS 2X1 October 15 to 31. Any hunters that drew a Wyoming general elk tag interested in a 5 day elk hunt price is $6500 and we expect very high success on bulls averaging 300 inches. Season dates will be October 1 to 31. Call for more details or speak with the outfitter on Hunt MD558. One of our top Alaska outfitters will personally guide this hunter on the Alaska Peninsula out of Pt. Heiden for his fall brown bear priced at $22,500. Hunt will be for 10 days starting October 7 and if the hunter needs any additional days there is no charge. This outfitter typically takes some giant bears in the spring and fall. Call for more details on Hunt BR247. New Mexico trophy bulls on Hunt EK278. 60,000 private acres located in northeastern New Mexico near Raton. Success has typically been 100 percent past several years on bulls averaging 330 inches, with top bulls breaking the 370 mark. Price is $14,000 5 days 1×1. Colorado elk Hunt EK163 this outfitter will take 2 to 3 elk hunters this November 13 to 17. Price is $5,500 for 5 days guided 2×1. Hunt takes place on private land located near Hotchkiss, an area known for good elk numbers. Average bulls are 5×5 with some 6 points. New Mexico archery elk $12,000 September 20 to 24. The outfitter only takes one or two archery elk hunters per year. Success has been 100 percent on bulls averaging over 320 inches. 60,000 private acres on Hunt EKB278. Colorado MDM554, October 19 to 23 or November 2 to 6. 5 days $4500 guided 2×1 with lodging and meals. This hunt takes place near Montrose, Colorado. Wyoming mule deer/pronghorn combo hunt at $5500 or mule deer only for $4000. 30,000 acres of private ranches in southeastern Wyoming, cabin accommodations, 2×1 guiding October 15 to 25. March 31 draw deadline and we expect hunters to be successful in the draw with 0 points. Hunt MD/PG264. New Mexico 5 day deer 1×1 $7500 late November or early December. Possibly a September muzzleloader hunt, all on large private ranches and they typically only take about 6 trophy mule deer hunters per year. Hunt MD278. Utah trophy hunt MD255 where bucks killed average over 190 inches and the price reflects the quality. This hunt is typically booked 2 years ahead to get a spot, but we have an early September hunt priced at $17,000 and a spot later at $15,000. 1×1 5 days. 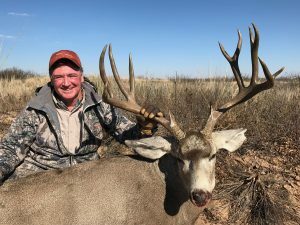 One Colorado top quality trophy archery mule deer hunt on MDB163. This is our best archery hunt in a very good area near Crawford that produces some tremendous deer especially in the archery season. Price is $6000 1×1 plus trophy fees of $500 for every 10 inches over 170. Example a buck in the high 180’s would cost you a trophy fee of $1000. Iowa whitetails Hunt WD799. Archery and shotgun/muzzleloader openings at $4000. Archery hunts are 6 days and gun are 5. You will need 3 points to draw a tag. We also recommend all whitetail hunters to get a point by calling 800-367-1188 in May. Very easy to do over the phone by credit card for about $50 and you do not have to designate a unit or choice of weapon, jut get a point. Nebraska archery whitetail $3750 5 days full service, October 28 to November 1. Last fall his 10 archers killed 6 bucks including 2 that grossed over 160 inches. All private land with a 125 inch minimum. Hunt WDB565. Colorado pronghorn on a RFW, anytime after August 15 we have 4 or 5 openings. Price is $2750 for Hunt PG226 and success has been 100 percent as on all our pronghorn hunts. 3 days full service 2×1. Wyoming pronghorn only $2000 on Hunt PG264. This is a good hunt for the money. Older cabin accommodations with a small outfitter running a family business. Southeastern Wyoming near Wheatland. If you have at least 6 preference points and want to put in for a top unit call us on Hunt PG371. This outfitter operates in all the top Wyoming pronghorn units and stays very small by only taking a few hunters each year. We have some scattered black bear, brown bear, grizzly, mountain lion, mountain goat, sheep, moose, caribou and muskox spots available. Naturally we have some terrific turkey hunts from Nebraska $775 to Florida for only $1400. Our 36 page color 2019 Big Game Annual will be sent out late January and if you are not on our mailing list please email us your address so you receive the new brochure. HCU has just started an email list to ensure that our clients get the latest information on any last minute deals that come up through the year due to cancellations and other discounts. We have sent one email to date, if you have not received it, and would like to receive this information over email, please email one of the consultants listed below and we will add your email to the listing.